In a year when beer volumes are flat or declining across the board, everyone is looking for answers. But particularly Anheuser-Busch, which is spending millions on advertising and craft brewery buyouts in an effort to stem a rising tide of losses. Unsuccessfully. AB, which today announced that it is acquiring Texas-based Karbach Brewing, earlier reported that Bud Light had the worst quarter of the year, with sales down nearly 4%. Overall AB shipments were down 2.5% for Q3. These are significant hits. AB isn't alone. Many brands are taking a beating this year, including some craft brands. 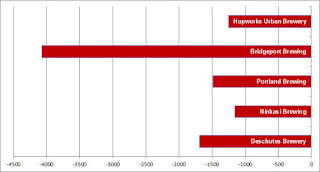 In Oregon, a year-to-year comparison of OLCC stats shows significant declines for several well-known breweries (see chart below). The Craft Brew Alliance, whose numbers strangely aren't part of OLCC stats, just reported that Widmer and Redhook are both down over 20 percent for the third quarter. Yikes! But never mind what's happening in craft beer. The craft marketplace is getting increasingly crowded and complicated. That's a separate discussion. Anyway, what's happening to big beer is far more interesting and entertaining. Because, aside from buying up craft breweries, their game plan hasn't changed that much. And it isn't working. One of AB's biggest bets this and every year is the NFL. The reality of our times, which features DVRs and plentiful viewing options, is that live sports programming is the last vestige of TV advertising. And the NFL has been the king of live sports for decades. Anheuser-Busch has been tapping that lifeline with ad dollars for years, and continues to do so. 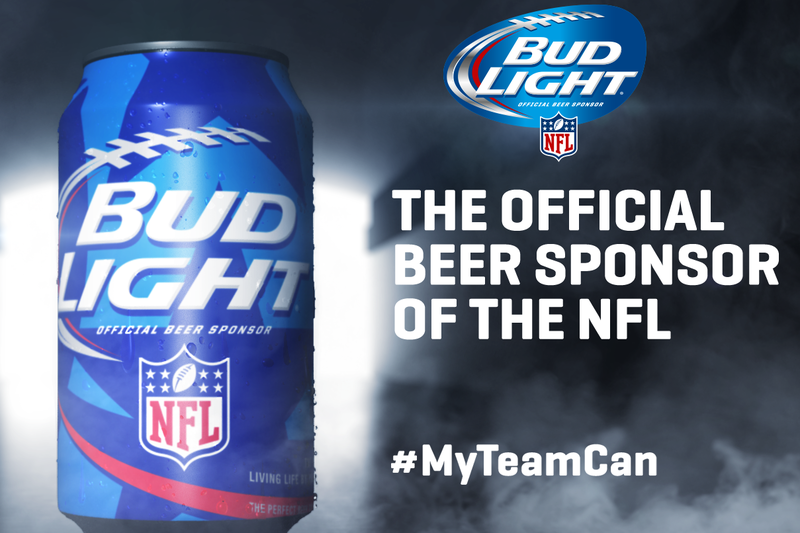 This year, AB's "Official Beer Sponsor" arrangement allowed it to release team-themed Bud Light cans for 28 of the 32 teams. You've seen these things in stores, of course. Here in the Northwest, we're mostly seeing Seahawks cans. Elsewhere, cans are similarly market-appropriate. But the cans campaign isn't panning out. In fact, it's apparently working in reverse because Bud Light is in virtual free fall right now. That naturally conjures up questions about why. When you spend big bucks on sponsorships and marketing campaigns, you expect results. It turns out NFL ratings, like Bud Light numbers, are in the tank. Overall NFL ratings are down 12 percent for the season. Ratings for Monday Night Football, sporting a new play-by-play guy thanks to the exit of Mike Tirico, are down 24 percent. ESPN, which aires MNF, lost more than 600,000 subscribers in October, its worst month on record. What's up with ratings? It depends on who you ask. Some suspects are poor play, crappy games, too many ads, player antics, election year noise, national anthem protests, etc. The most persuasive argument for me is that younger fans who play fantasy football track player stats on their smartphones don't get their NFL fix the traditional way...and don't show up in ratings. Exactly how lower NFL ratings and beer consumption are related is unclear. If folks of beer drinking age aren't watching games on the tube, there may be some correlation between slumping ratings and the decline in Bud Light sales. But everyone needs to stop and recall that a number of established brands with no connection to the NFL are facing challenges this year. In a flat year, it's tough to see what's driving things. AB's team can campaign may get better traction through the end of the year. It was just getting underway in Q3. Bud Light numbers and NFL ratings may also bounce back as we enter the holidays and the stretch run of the season. So there's no need to look for scapegoats, yet. We'll get there.